Chemotherapy (often abbreviated to chemo and sometimes CTX or CTx) is a category of cancer treatment that uses one or more anti-cancer drugs (chemotherapeutic agents) as part of a standardized chemotherapy regimen. Chemotherapy may be given with a curative intent (which almost always involves combinations of drugs), or it may aim to prolong life or to reduce symptoms (palliative chemotherapy). 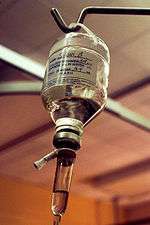 Chemotherapy is one of the major categories of medical oncology (the medical discipline specifically devoted to pharmacotherapy for cancer). By common usage, the term chemotherapy has come to connote the use of rather non-specific intracellular poisons, especially related to inhibiting the process of cell division known as mitosis, and generally excludes agents that more selectively block extracellular growth signals (i.e. blockers of signal transduction). For purely historical reasons, the blockade of growth promoting signals coming from classic endocrine hormones (primarily estrogens for breast cancer and androgens for prostate cancer) is known as hormonal therapy, while the blockade of other growth promoting influences (especially those associated with receptor tyrosine kinases) is known as targeted therapy. Importantly, the use of drugs (whether chemotherapy, hormonal therapy or targeted therapy) constitutes "systemic therapy" for cancer in that they are introduced into the blood stream and are therefore in principle able to address cancer at any anatomic location in the body. Systemic therapy is often used in conjunction with other modalities that constitute "local therapy" (i.e. treatments whose efficacy is confined to the anatomic area where they are applied) for cancer such as radiation therapy, surgery, and/or hyperthermia therapy. Traditional chemotherapeutic agents are cytotoxic by means of interfering with cell division (mitosis) but cancer cells vary widely in their susceptibility to these agents. To a large extent, chemotherapy can be thought of as a way to damage or stress cells, which may then lead to cell death if apoptosis is initiated. Many of the side effects of chemotherapy can be traced to damage to normal cells that divide rapidly and are thus sensitive to anti-mitotic drugs: cells in the bone marrow, digestive tract, and hair follicles. This results in the most common side-effects of chemotherapy: myelosuppression (decreased production of blood cells, hence also immunosuppression), mucositis (inflammation of the lining of the digestive tract), and alopecia (hair loss). Because of the effect on immune cells (especially lymphocytes), chemotherapy drugs often find use in a host of diseases that result from harmful overactivity of the immune system against self (so-called autoimmunity). These include Rheumatoid arthritis, Systemic lupus erythematosus, Multiple sclerosis, Vasculitis, and many others. ↑ Rampling R, James A, Papanastassiou V (Jun 2004). "The present and future management of malignant brain tumours: surgery, radiotherapy, chemotherapy". Journal of Neurology, Neurosurgery, and Psychiatry. 75 Suppl 2 (Suppl 2): ii24–30. doi:10.1136/jnnp.2004.040535. PMC 1765659 . PMID 15146036. ↑ Du Bois D; Du Bois EF. "A formula to estimate the approximate surface area if height and weight be known. 1916.". Archives Internal Medicine. 5 (5): 303–11. 1 2 Gurney H (Apr 2002). "How to calculate the dose of chemotherapy". British Journal of Cancer. 86 (8): 1297–302. doi:10.1038/sj.bjc.6600139. PMC 2375356 . PMID 11953888. 1 2 3 4 5 6 7 8 9 10 Gamelin EC; Delva R; Jacob J; Merrouche Y; Raoul JL; Pezet D; Dorval E; Piot G; Morel A; Boisdron-Celle M (2008). "Individual fluorouracil dose adjustment based on pharmacokinetic follow-up compared with conventional dosage: Results of a multicenter randomized trial of patients with metastatic colorectal cancer". J Clin Oncol. 26 (13): 2099–2105. doi:10.1200/jco.2007.13.3934. ↑ Kaldate RR; Haregewoin A; Grier CE; Hamilton SA; McLeod HL. "Modeling the 5-fluorouracil area under the curve versus dose relationship to develop a pharmacokinetic dosing algorithm for colorectal cancer patients receiving FOLFOX6". Oncologist. 17 (3): 296–302. doi:10.1634/theoncologist.2011-0357. ↑ "ARK™ Methotrexate Assay". Ark Diagnostics. 1 2 3 Damia G, D'Incalci M (Sep 1998). "Mechanisms of resistance to alkylating agents". Cytotechnology. 27 (1-3): 165–73. doi:10.1023/A:1008060720608. PMC 3449574 . PMID 19002790. 1 2 3 Parker WB (Jul 2009). "Enzymology of purine and pyrimidine antimetabolites used in the treatment of cancer". Chemical Reviews. 109 (7): 2880–93. doi:10.1021/cr900028p. PMC 2827868 . PMID 19476376. ↑ Nitiss JL (May 2009). "Targeting DNA topoisomerase II in cancer chemotherapy". Nature Reviews. Cancer. 9 (5): 338–50. doi:10.1038/nrc2607. PMC 2748742 . 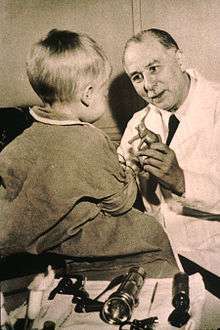 PMID 19377506. ↑ Sobell HM (Aug 1985). 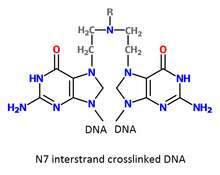 "Actinomycin and DNA transcription". Proceedings of the National Academy of Sciences of the United States of America. 82 (16): 5328–31. Bibcode:1985PNAS...82.5328S. doi:10.1073/pnas.82.16.5328. PMC 390561 . PMID 2410919. ↑ Wood, Miriam, David Brighton (2005). The Royal Marsden Hospital handbook of cancer chemotherapy: a guide for the multidisciplinary team. St. Louis, Mo: Elsevier Churchill Livingstone. pp. 93–94. ISBN 0-443-07101-2. ↑ Moreno-Ramirez D, de la Cruz-Merino L, Ferrandiz L, Villegas-Portero R, Nieto-Garcia A (2010). "Isolated limb perfusion for malignant melanoma: systematic review on effectiveness and safety". The Oncologist. 15 (4): 416–27. doi:10.1634/theoncologist.2009-0325. PMC 3227960 . PMID 20348274. ↑ Hendriks JM, Van Schil PE (1998). "Isolated lung perfusion for the treatment of pulmonary metastases". Surgical Oncology. 7 (1-2): 59–63. doi:10.1016/S0960-7404(98)00028-0. PMID 10421507. ↑ Brock PR, Knight KR, Freyer DR, Campbell KC, Steyger PS, Blakley BW, Rassekh SR, Chang KW, Fligor BJ, Rajput K, Sullivan M, Neuwelt EA (Jul 2012). "Platinum-induced ototoxicity in children: a consensus review on mechanisms, predisposition, and protection, including a new International Society of Pediatric Oncology Boston ototoxicity scale". Journal of Clinical Oncology. 30 (19): 2408–17. doi:10.1200/JCO.2011.39.1110. PMC 3675696 . PMID 22547603. ↑ Rybak LP, Mukherjea D, Jajoo S, Ramkumar V (Nov 2009). "Cisplatin ototoxicity and protection: clinical and experimental studies". The Tohoku Journal of Experimental Medicine. 219 (3): 177–86. doi:10.1620/tjem.219.177. PMC 2927105 . PMID 19851045. ↑ Weeks JC, Catalano PJ, Cronin A, Finkelman MD, Mack JW, Keating NL, Schrag D (Oct 2012). "Patients' expectations about effects of chemotherapy for advanced cancer". The New England Journal of Medicine. 367 (17): 1616–25. doi:10.1056/NEJMoa1204410. PMC 3613151 . PMID 23094723. ↑ Moschovi, Maria. "Drugs acting on homeostasis: challenging cancer cell adaptation.". Expert Rev Anticancer Ther. 15 (12): 1405–17. doi:10.1586/14737140.2015.1095095. PMID 26523494. ↑ Hodgson S (Jan 2008). "Mechanisms of inherited cancer susceptibility". Journal of Zhejiang University. Science. B. 9 (1): 1–4. doi:10.1631/jzus.B073001. PMC 2170461 . PMID 18196605. 1 2 Ben-Ari ET (Apr 2004). "Dual purpose: some cancer therapies used to treat autoimmune diseases". Journal of the National Cancer Institute. 96 (8): 577–9. doi:10.1093/jnci/96.8.577. PMID 15100330. 1 2 Cutolo M, Sulli A, Pizzorni C, Seriolo B, Straub RH (Aug 2001). "Anti-inflammatory mechanisms of methotrexate in rheumatoid arthritis". Annals of the Rheumatic Diseases. 60 (8): 729–35. doi:10.1136/ard.60.8.729. PMC 1753808 . PMID 11454634. ↑ Bacigalupo A, Ballen K, Rizzo D, Giralt S, Lazarus H, Ho V, Apperley J, Slavin S, Pasquini M, Sandmaier BM, Barrett J, Blaise D, Lowski R, Horowitz M (Dec 2009). "Defining the intensity of conditioning regimens: working definitions". Biology of Blood and Marrow Transplantation. 15 (12): 1628–33. doi:10.1016/j.bbmt.2009.07.004. PMC 2861656 . PMID 19896087. ↑ Nichols HJ, Walker JE (Mar 1923). "EXPERIMENTAL OBSERVATIONS ON THE PROPHYLAXIS AND TREATMENT OF SYPHILIS". The Journal of Experimental Medicine. 37 (4): 525–42. doi:10.1084/jem.37.4.525. PMC 2128372 . PMID 19868743. ↑ Larkin JO, Collins CG, Aarons S, Tangney M, Whelan M, O'Reily S, Breathnach O, Soden DM, O'Sullivan GC (Mar 2007). "Electrochemotherapy: aspects of preclinical development and early clinical experience". Annals of Surgery. 245 (3): 469–479. doi:10.1097/01.sla.0000250419.36053.33. PMC 1877027 . PMID 17435555. ↑ Mir LM, Gehl J, Sersa G, Collins CG, Garbay JR, Billard V, Geertsen PF, Rudolf Z, O'Sullivan GC, Marty M (2006). "Standard operating procedures of the electrochemotherapy: Instructions for the use of bleomycin or cisplatin administered either systemically or locally and electric pulses delivered by the CliniporatorTM by means of invasive or non-invasive electrodes". Eur J Cancer Suppl. 4 (11): 14–25. doi:10.1016/j.ejcsup.2006.08.003. ↑ Miklavcic D, Snoj M, Zupanic A, Kos B, Cemazar M, Kropivnik M, Bracko M, Pecnik T, Gadzijev E, Sersa G (2010). "Towards treatment planning and treatment of deep-seated solid tumors by electrochemotherapy". Biomedical Engineering Online. 9 (1): 10. doi:10.1186/1475-925X-9-10. PMC 2843684 . PMID 20178589. Wood, Miriam, David Brighton (2005). The Royal Marsden Hospital handbook of cancer chemotherapy: a guide for the multidisciplinary team. St. Louis, Mo: Elsevier Churchill Livingstone. ISBN 0-443-07101-2. Fergus Macbeth, Hanna, Louise, Crosby, Tom (2008). Practical clinical oncology. Cambridge, UK: Cambridge University Press. Hirsch J (Sep 2006). "An anniversary for cancer chemotherapy". JAMA. 296 (12): 1518–20. doi:10.1001/jama.296.12.1518. PMID 17003400.